Domaine du Pere Caboche has a long history in the Chateauneuf du Pape appellation that dates all the way back to 1652 when the property was owned by the Chambellan family. Through marriage and a dowry, the property passed to the Boisson family who still own and manage the estate today. If you’re wondering how a winery owned by the same family uses a name other than their family name on the label, the explanation is charming and simple. Caboche is a translation for horse shoe nails which is related to the families previous occupation as blacksmiths. It is important to realize that for most growers in the Southern Rhone, many families needed a second job as until recently, the wine were difficult to sell. Domaine du Pere Caboche was officially established in 1950. Jean Pierre Boisson whose name appears on the bottles today has quite a history in the Chateauneuf du Pape appellation. Not only was the popular and energetic, Jean Pierre Boisson president of the Federation of Chateauneuf du Pape growers, he was also the mayor of Chateauneuf du Pape! A very busy man indeed. Jean-Pierre Boisson Domaine du Pere Caboche owns 23 hectares of vines in Chateauneuf du Pape. 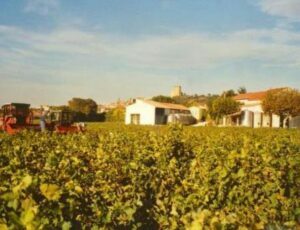 20 hectares are devoted to the production of red wine and 3 hectares are reserved for the white wine grapes. The estates best vines are their 17 hectares located in the La Crau sector with its rocky, limestone soils. Jean-Pierre Boisson Domaine du Pere Caboche produces 2 red Chateauneuf du Pape wines and 1 white Chateauneuf du Pape wine. Jean-Pierre Boisson Domaine du Pere Caboche Tradition is a blend of mostly Grenache with Syrah and Mourvedre. But depending on the vintage, you can find small amounts of Cinsault, Counoise, Muscardin, Terret Noir, Vaccarese, Bourboulenc, Clairette, Grenache Blanc, Roussanne and Picpoul in the blend. The terroir is mostly rocks, stones and sand, with a sliver of limestone. The vines are scattered in the Barbe d’Asne, la Crau, la Font du Pape, le Parc, les Plagnes, and les Serres lieux-dits. The wine is aged in a combination of traditional concrete vats and old, large, oak foudres for between 12 to 14 months. This well priced wine is easy to find as slightly more than 6,500 cases are produced each year. Jean-Pierre Boisson Domaine du Pere Caboche Elisabeth Chambellan is produced from the estate’s oldest Grenache vines that range in age from 80 years to over 100 years. The wine is made from usually 95% Grenache and 5% Mourvedre. All of the grapes come from the la Crau vineyard. The wine is aged half in foudres and 50% in concrete tanks for between 12 to 24 months, depending on the character and quality of the vintage. For a wine of this quality made from vines this old, this is a steal in the marketplace! Jean-Pierre Boisson Domaine du Pere Caboche Blanc is on average a blend of 40% Roussanne, 40% Clairette, 10% Grenache Blanc and portions of Picpoul and Bourboulenc. Domaine du Pere Caboche can be enjoyed on the young side. Young vintages can be popped and poured, or decanted for about 1 hour, give or take. This allows the wine to soften and open its perfume. Older vintages might need very little decanting, just enough to remove the sediment. Domaine du Pere Caboche is usually better with 2-4 years of bottle age. Of course that can vary slightly, depending on the vintage. In the best vintages the wine should be consumed within 3-12 years after the vintage. Domaine Pere Caboche is best served at 15.5 degrees Celsius, 60 degrees Fahrenheit. The cool, almost cellar temperature gives the wine more freshness and lift. Domaine Pere Caboche is best served with all types of classic meat dishes, veal, pork, beef, lamb, duck, game, roast chicken, roasted, braised, stewed dishes, sausage, grilled meats, barbecue and cassoulet. Domaine Pere Caboche is also good with Asian dishes, hearty fish courses like tuna, mushrooms, cheese, pasta, eggplant and tomatoes. The white wine of Jean Pierre Boisson Domaine Pere Caboche is best served with a myriad of different seafood dishes, shellfish, crab, lobster, sushi, sashimi, chicken, pork and veal, as well as Asian cuisine. Domaine du Pere Caboche Jean-Pierre Boisson also produces red and white wine in the Cotes du Rhone appellation. Domaine du Pere Caboche Chateauneuf du Pape la Mirande is made for the top luxury hotel in Avignon, La Mirande. The wine is not exported and what is not sold to the hotel is offered in France. Domaine du Pere Caboche Chateauneuf du Pape Elisabeth Chambellan V V Blanc is no longer in production. Soft, salty fresh and offering polished red berries and kirsch on the spicy side, the wine is made from blending 88% Grenache, 10% Syrah and 2% Mourvedre. Supple, silky and polished, with good freshness, length and purity in its sweet, kirsch, cherry and plummy fruits. The wine is made from blending 80% Grenache, 15% Syrah and 5% Mourvedre. Flowery, with an herbal, kirsch and spiced, cherry character, there is freshness, silky tannins and sweet, soft red fruits on the finish. The blend comes from 95% Grenache and 5% Mourvedre. Light in color, the wine offers a purity of flavor and elegant texture over volume. Fresh, clean and forward, this will be great on release. The wine is made from blending 80% Grenache, 15% Syrah and 5% Mourvedre. Medium bodied, with a fresh, sweet, polished, strawberry, herbal, floral and spice profile. On the palate, the already open wine offers soft tannins and a forward, fruity, red berry approach for tasty, near term drinking pleasure. Elegant, finesse styled, medium bodied, fresh and forward, with a silky textured finish and a big dose of Provencal herbs and kirsch. Finesse styled, medium bodied, red berry focused wine that drinks well young. The wine is a product of 80% Grenache, 15% Syrah and 5% Mourvedre. Sweet strawberry jam, plum and silky cherries make their presence known and remain from start to finish in this medium bodied charmer. Medium bodied, soft, elegant and refined, this is a Burgundian styled Southern Rhone without the acidity. Starts off with sweet ripe cherries and kirsch, with a blast of freshness and strawberry jam in the lively finish. Produced from a blend of 70% Grenache, 20% Syrah and 10% Mourvedre, the wine reached 15% alcohol. Medium bodied and elegantly textured, there is good freshness in the spicy finish. Silky, soft, elegant and refined, the wine is polished, fresh, round and ripe, plus it’s already delivering much of its charms. Showing light spicy, red berries, this medium bodied, charming wine ends with a cherry finish. Lush round textures, ripe, sweet, dark red, juicy fruits, medium/full bodied with a kirsch, jam and floral character. This is already showing quite well.